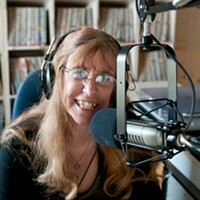 Station coordinator Leah Girardo is excited that CKDU continues to reign the airwaves. She lists off some of the highlights from last year: “really outstanding youth programming through the C@P youth journalism programs; another successful funding drive; a fantastic Homelessness Marathon 14-hour broadcast which included a live listening booth at St. Matthews’ Church; spectacular Pride Week coverage including a trans perspective from Over the Rainbow host Denise Holliday, and a National Community Radio award for local favourites, Let’s Get Baked with Mat and Dave. Umm, Girardo forgot one bizarro highlight. Three words: Crispin Hellion Glover.